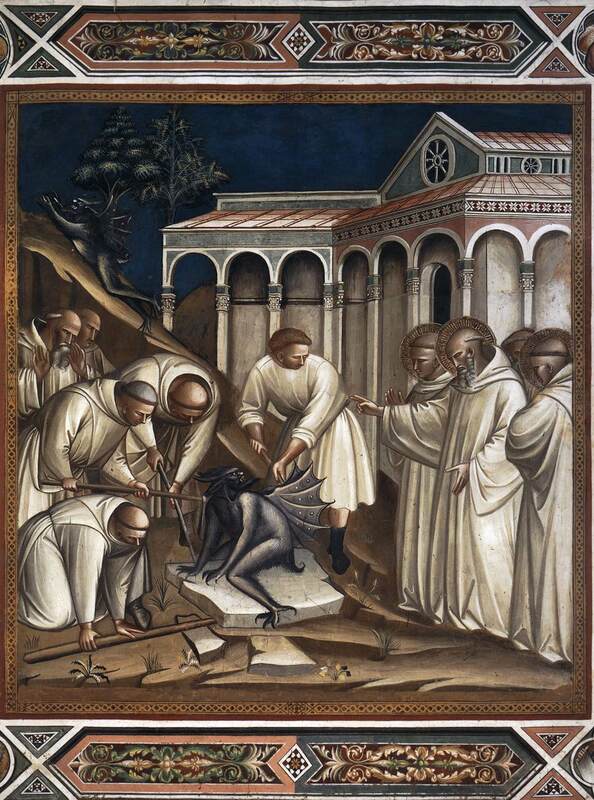 The episode referred to in the antiphon above, depicted in the sacristy of the church of San Miniato in Florence by Spinello Aretino, 1388. The Lord’s glorious confessor, making his prayer, gave the blessing, and the stone, upon which teh ancient enemy sat, was at once lifted up. On a certain day, when the monks were building up the cells of the same abbey, there lay a stone which they meant to employ about that business: and when two or three were not able to remove it, they called for more company, but all in vain, for it remained so immovable as though it had grown to the very earth. They plainly perceived that the devil himself sat on it, seeing so may men's hands could not so much as once move it: wherefore, finding that their own labors could do nothing, they sent for the man of God, to help them with his prayers against the devil, who hindered the removing of that stone. The holy man came, and after some praying, he gave it his blessing, and then they carried it away so quickly, as though it had been of no weight at all. St Benedict died on March 21 in the year 543 or 547, and this was the date on which his principal feast was traditionally kept, and is still kept by Benedictines; it is sometimes referred to on the liturgical calendars of Benedictine liturgical books as the “Transitus - Passing” There was also a second feast to honor the translation of his relics, which was kept on July 11. The location to which the relics were translated is still a matter of dispute, with the Abbey of Monte Cassino in Italy, founded by the Saint himself, and the French Abbey of Fleury, also known as Saint-Benoît-sur-Loire, both claiming to possess them. This second feast is found in many medieval missals and breviaries, even in places not served by monastic communities. (It was not, however, observed by either the Cistercians or Carthusians.). The second feast was in a certain sense the more solemn in the traditional use of the Benedictines; March 21 always falls in Lent, and the celebration of octaves in Lent was prohibited, but most monastic missals have the July 11 feast with an octave. In the post-Conciliar reform of the Calendar, many Saints, including St Benedict, were moved out of Lent; in his case, to the day of this second feast in the Benedictine Calendar.